on July 24, 2014 at 1:39 pm You couldn't make it up! It seriously calls into question the judgement of those who appointed them. I’d have thought a cursory check of Facebook and Twitter for past references to employers would be routine – but obviously not at Tower Hamlets. What sort of contract is he employed on? One that can be terminated quickly? He had it renewed after the election and I think, but not sure, it’s for six months. What precisely has this joker done for Tower Hamlets? That’s easy to answer …. Taken loads of the public’s money and laughed at the nincompoops who engaged him ? 2. How many days, and how many hours per week, does Meic Sullivan-Gould work for LBTH? 3. How many hours, out of the total quantity of hours that Meic Sullivan-Gould works for the LBTH, occurs in official LBTH premises? 5. What plans has LBTH to republish Meic Sullivan-Gould’s thanks to Tower Hamlets for his new car, in the council’s official newspaper and/or on the council’s web site? 6. Is Meic Sullivan-Gould, or the local authority, planning to share Meic Sullivan-Gould’s new car joy with the Secretary of State for Communities & Local Government? Anyone impressed by the work, for the LBTH, of Meic Sullivan-Gould? allowances by these officers for travel to work. mileage rates they are entitled to claim. directly employed by the Authority hence no invoices have been submitted. band ranges from £85,275 to £100,557pa. when evening meetings (2 or 3 each month) extend the day. Gould works for the LBTH, occurs in official LBTH premises? and/or on the council’s web site? Have to say, I don’t really see what the problem is here. Meic does a job. Meic gets paid for doing his job. Meic chooses to spend that money on a cheap-but-slightly-flashy car. Meic puts picture of cheap-but-flashy car on facebook with a comment as to how he paid for it. He has form – he’s done the same thing, with identical wording, before. The wording is slightly antagonistic but it’s not insulting or damaging, and the free country that we live in allows him to post this sort of thing on facebook and to spend his money as he chooses. The fact that Meic does his job spectacularly badly and is monumentally overpaid for it is a different point, as is the fact that he is paid more than most people who live in the borough. Neither have a bearing on the above. I agree with you Tim. Either Jeory is running low on content or he thinks readers of his blog are a little stupid. I like to think it is the former. This is not news nor is it worth blogging about. It makes me uncomfortable that what Meic gets up to in his spare time is being put on one of London’s most widely read blogs. Meic is entitled to his private life. We should have respect for such a basic human right. My guess is he doesn’t care because he’s not stupid. Is that arrogance? And if you don’t get that you’re either being obtuse or a little stupid. Ted, one’s right to privacy is enshrined in the European Convention of Human Rights. Any interference with that right has to be shown to be in accordance with law, pursue a legitimate aim and be necessary and proportionate. Frankly, Jeory, just because he has not got the right privacy settings does not give you the right to violate his right to privacy. Nor has he opted out of his right to privacy by not having the approproate privacy settings. Jeory, call me obtuse, stupid or whatever you like, I will speak up one’s rights where I see that those rights have been unnecessarily and unlawfully interferred with. Methinks your questionable legal training is getting in the way of your common sense. Maybe you’re not being obtuse after all. Meic is entitled to his private life. We should have respect for such a basic human right. Posting on so-called ‘social media’ (is there an anti-social media?) was a concious decision by Meic Sullivan-Gould to abandon aspects of his private personal and private working life. Meic Sullivan-Gould wanted to tell the world what he thought of ‘Tower Hamlets’. No good making phoney claims that this blog is not respecting Meic Sullivan-Gould’s basic Human Right to private and family life (known in the UK as privacy) when Meic Sullivan-Gould is telling the public at large about his latest asset and that is was entirely funded by the public of Tower Hamlets. Privacy is important but when someone decides, as Meic Sullivan-Gould voluntarily did, that his wanted to abandon his privacy your protests are irrelevant. 1. The correct title is the Council of Europe’s: Convention for the Protection of Human Rights and Fundamental Freedoms (treaty CETS No. : 005). 2. It was been expanded and revised by several protocols. 3. Its been republished as part of the EU’s Maastricht Treaty. It’s been diluted as Tony Blair’s 1998 Human Rights Act. Understanding even a bit of the law can be helpful before pronouncing on it. Curious Cat, there is no suggestion that Meic’s car was funded by the people of TH. Where did you get that from? What if he bought it with money he saved up from before he got a job at TH council? All Meic said was, “…thanks Tower Hamlets”. It could mean lots of different things. He probably has an odd sense of humour. If anything, he is showing his appreciation to Tower Hamlets, because his latest assignment brought him here. We should applaud him for that. Anyway, it is a little crass and shows poor judgment to pull stuff off one’s Facebook and subject him to unnecessary public scrutiny and/or ridicule. Just because he works for a local authority does not give us an unfettered right to subject him to whatever we like on the blog when the stuff has nothing to do with his work as a monitoring officer for the council. A little perspective would help us all. Curious Cat, thank you for your deliberations on the European Convention on Human Rights. And, yes, I agree with you that understanding even a bit of the law is helpful before pronouncing on it. …. there is no suggestion that Meic’s car was funded by the people of TH. Where did you get that from? What if he bought it with money he saved up from before he got a job at TH council? 1. The posting had a connection to a motor vehicle, the one displayed. 2. The posting had a connection to ‘Tower Hamlets’. 3. Meic Sullivan-Gould was happy and/or pleased. 4. Meic Sullivan-Gould wanted to tell the world of his happiness and/or pleasure. 5. Meic Sullivan-Gould was thanking ‘Tower Hamlets’. 6. The thanks was connected to the motor vehicle. The public would wonder what precisely was the source of Meic Sullivan-Gould’s happiness and/or pleasure. (a) Was it a Lottery win? (b) Was it a cash bonus? (c) Was it a new house? (d) Was it incredibly desirable young woman? (e) Was it a trip to the Moon? Because Meic Sullivan-Gould chose not to identify the specific source of his happiness and/or pleasure, those viewing his pubic utterance had to look for clues. No pile of cash, no signs of a new house and no delectable young woman either. Foregrounds of pictures usually contain the main subject of interest. What was in the foreground of the picture Meic Sullivan-Gould chose to accompany his declaration of thanks? It was a motor vehicle. Who or want is Tower Hamlets? It is one of the 33 London Boroughs (32 plus the City of London which is not technically a ‘London Borough’.) It is also the commonly used title of an English local authority named The London Borough of Tower Hamlets. 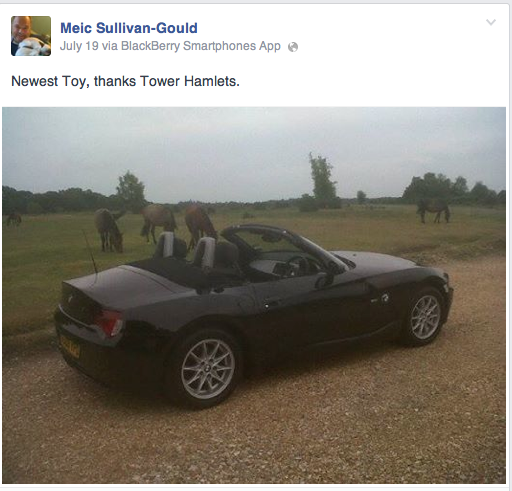 What connection does Meic Sullivan-Gould have with anything named Tower Hamlets? He is employed directly or via a third party by the London Borough of Tower Hamlets (‘LBTH’). It is logical to assume, therefore, Meic Sullivan-Gould is thanking his employer, or if engaged via a third party, the so-called “customer”). Did LBTH give Meic Sullivan-Gould the motor vehicle or alternatively sufficient money to him to purchase the motor vehicle? Did LBTH paint the vehicle black, or fit new tires or hoover-out and wash the vehicle? Because Meic Sullivan-Gould chose not to give these details, it is inevitable the public will attempt to make an accurate assessment based on the available information. The conclusion in most people’s minds is LBTH gave Meic Sullivan-Gould the cash to buy the vehicle AND Meic Sullivan-Gould is a so happy about that event, he wants to tell the world that he thanks LBTH. There is no indication of humour in the posting; only of genuine thanks. Then what has the main subject of the photograph to do with LBTH? If you want to thank someone for a job, would you hire, for example, a Rolls Royce and photograph it at your home, then use the picture to thank your employer? Facebook is a privacy lacking public source of personal information about people who choose to use it. My experience is it is primarily used by people who want to tell the world every small personal thing about their lives. Importantly why should unelected by the public and unaccountable to the public senior local authority officials not be scrutinised? Why should this often faceless individuals, always paid more than the UK’s prime minister, be exempt from public comment especially when they make public utterances? No “unfettered right” exists in English law. For example private law (tort for defamation) and public law (for malice, harassment) remedies exist. Why are you so keen to prevent the public making lawful comment on the public conduct of the holder of one of the three statutory local authority posts ? Local government is badly in need of lots of fresh air, lots of exposure to the light, lots of transparency and lots of genuine accountability to the public who pay the mandarins’ often exorbitant salaries and perks. What other perspective would you wish me to consider? on July 25, 2014 at 7:28 pm You couldn't make it up! What Curious Cat said – spot on comment. I’d also like to add that a man who brags like that seriously lacks good judgement which is a jolly good reason for making him ineligible for employment as a Monitoring Officer. I wonder if he brings the car to work and I wonder if he declares his parking space as a taxable benefit to HM Revenue & Customs…….. Surely a public figure using public outlets to boast of his profligacy with taxpayer’s public money is entitled to be scrutinised on any public arena. If the man desired, requested or required a human rights, private life then he shouldn’t be such a boastful, bumptious arse in promulgating how the poor of the East end is feeding his avarice and rewarding incompetence. Money that is earned as part of his employment isn’t public money though, is it? He may well an incompetent, overpaid, avaricious nobody but he has a job and earns his own money. Really, the ire of posters on here would be much better reserved for those who teach in mosques that it’s fine to claim benefits despite it being prohibited by their religion because anything taken from those dirty kaffirs is halal if it is of benefit to a muslim. Or for councillors who openly abuse the benefits system and seem to be sentenced remarkably lightly. Or a baroness who is caught red-handed in an expenses fiddle but is forced to pay back a mere £125,000 – a tiny fraction of what she stole. Or indeed for someone who ponces around in a completely unnecessary car which is entirely paid for by public money. Those are just a few examples of public money being spent on private luxuries, and should be damned. He’s the one saying ‘Thanks Tower Hamlets’ in public. It’s crass. And a question of character and judgment. Yet again. It could be regarded as crass and tasteless, perhaps. But really – are we censuring something as trivial as a post on facebook which could be read in many ways, one of which is possibly slightly antagonistic? I’m no fan of Sullivan but let’s keep our opprobium for things that really matter and leave things like this in the playground, where they belong. I question the meaning of “earn”. Many in local government are paid substantially more than the UK’s prime minister (2 salaries combined = £142,000 p.a.). Being paid oodles of public dosh is, in my opinion, not the same as genuinely “earning” that dosh. There has been for many years total abuse of the public’s finances by the travelling circus of public parasites to the conspicuous detriment of the paying public. Both Labour and the Conservatives love this abuse otherwise they would have cleaned-up this public disgrace. P.S. Margaret Hodge – how about an inquiry into this local government overpayment scandal ? on July 26, 2014 at 3:39 am You couldn't make it up! Obviously the Monitoring Officer must be exempt from anything like that! I mean that would involve behaving like a local government officer as opposed to a very highly paid temporary member of staff. You surely do not mean professional standards of public inspiring conduct should apply to the holders of statutory local authority posts? What a revolutionary idea. For the unenlightened they are monitoring officer, chief finance officer (s.151) and head of paid service (chief executive/managing director etc.). Apparently from what Gould said, all of this is not illegal. merely an administraive error.. or errors… so we should all forget about them, then smirk that these investigations cost money and we shouldn’t be spending money. And also, something about false allegations bringing down the council’s reputation (from how high? one may ask) – so the questions should really never have been raised in the first place. It never seemed to have occurred to him (or to the councillors reading their questions off pre-prepared cards) that so many errors and breaches of ‘best practice’ but apparently not law in this one case, probably implies many other errors, some of which may involve the law, in other cases of disposals, procurement, God knows what else. Who knows what hooky deals are lurking unseen in the depths? God, I don’t know why doesn’t DCLG do something about that vipers nest of craven council staff who think they owe their jobs to Lutfur and so need to defend him at every turn, rather than doing what is right. Seems, in my personal opinion, like corruption. Surely its time for the ECU (the new name for the Fraud Squad, the Economic Crime Unit) to start interviewing? No, no, Curious Cat, we were all assured by Mr Gould at Tuesday’s meeting that none of these four matters raised issues of law, only the best practice of the council being flouted on four separate occasions, not the law; so, nothing to see here, move along. You would need to prove criminal intent. > You would need to prove criminal intent. But only at the trial if one wants a guilty verdict. How about starting with something pursuant to the Fraud Act 2006 then adding conspiracy and whatever else may be useful ? Surely suspicion of these offences is sufficient for arrest and search – some dodgy cops do both pursuant to their interpretation of PACE, thus without a warrant. Some years ago the non-normal fuzz who are in constant contact with the Security Service, told me, Corruption is endemic in local government . If anyone should know, it will be them and MI5. Disappointingly local authority corruption is so widespread and less important than terrorism and other substantially important matters (can’t elaborate) that those fuzz consider council crooks inconsequential and their suspicious activities are effectively ignored. Due to the nature of the job, those fuzz tend not to feed all their discoveries including suspicions to the ordinary Plod; perhaps because.the ordinary Plod are generally considered untrustworthy. Unless the ordinary Plods stumble across them, and we all know how lazy, indifferent and incompetent ordinary Plods can be, the council crooks are immune from investigation. The problem is exaggerated by the Plods politically correct obsession with partnership working with the local authority. How can someone on duty or in their off-duty hours, who shares alcoholic drinks with senior local authority staff and/or councillors, over a meal or a cordial get-together or other social event (probably never declared in the police register) even begin to think bad things suggesting that his or her mates and their clique may have done something criminally wrong ? Attempting to get Plods to investigate their local authority mates is harder than pulling-out a single tooth from the open jaws of a crocodile. OK, there will be exceptions but I write about generalities, in real life, in England, in these days. Not only does English local government need cleaning-up, so too does the “ordinary” branch of the fuzz. Plods know favouritism towards anyone is wrong but there seems to be an exception for local authority big-wigs – senior staff and top councillors. Forget allegations of rampant corruption in Africa, the Indian sub-continent and elsewhere around the world, it is here in England today and it is growing. on July 28, 2014 at 2:13 pm You couldn't make it up! Breaches of the London Borough of Tower Hamlets Constitution and Finance Regulations, Office of Government Commerce Procurement Policy Guidelines, EU guidance for Procurement, the Freedom of Information Act are NOT “simple administrative errors”. 3.5	In law, a fiduciary is someone who occupies a position of such power and confidence over the property of another that the law requires him or her to act solely in the interests of the person s/he represents. This is in contrast with an ordinary business relationship, in which each party is free to seek purely personal benefits from his or her transactions with the other. So for example, a guardian, a trustee or an executor are all fiduciaries. 3.6	As a Member controlling the Council’s assets and finances, you are in a position of trust. You have a fiduciary duty to act in the interests of the people of Tower Hamlets and ensure that expenditure decisions are prudent and lawful. We can all ponder on what those legal implications might be. This is a massive slap in the face to hard working local government workers who are enduring wage cuts, rising living costs and horrific job losses because of public sector cuts. It’s just a very silly and incredibly insensitive comment to make on social media, coming as they do from a senior council official of his rank who ought to know better. While I agree there is too much sensitivity over what we say, there is a big difference between the general public making insensitive comments, and a person in public office making a public comment, and a prime example of what LBTH has become. on July 28, 2014 at 1:58 pm You couldn't make it up! One used to be able to expect that senior officers had more than a passing acquaintance with the notion of social responsibility and proper ways of behaving given the nature of the post held and the significance of its duties. One is prompted to wonder what were the reasons for him leaving his previous employers…….. But those were the days when people had standards and local government workers possessed commitment, dignity and dedication to the lofty principals of local government service. There was no barrier between “them” and “us”. Meic is merely the manifestation of a growing problem, which is: uncaring and unaccountable local government is ripping-off the public – it is out-of-control. Wonder if he “retired” and got a huge pay-off then returned to local government as a highly paid “consultant” ?